The weather is relenting; the cold retreating. Birds are singing and trees are putting on their Spring buds. It’s gardening season and I have some tips for you on how to make the most of the next two months. Outside, it’s cool weather crop planting time in Zone 6A or 6B or whatever USDA is calling it now. For me, that means putting in lettuce seeds in the old truck bed and sowing beet seeds. I’ll keep both watered by hand (a hose would still freeze solid) for the next 2 to 3 weeks while their hard hulls soften, crack and start to reach for the sun. Inside, I’ve transplanted the baby kale to small pots and given them a quick feed. 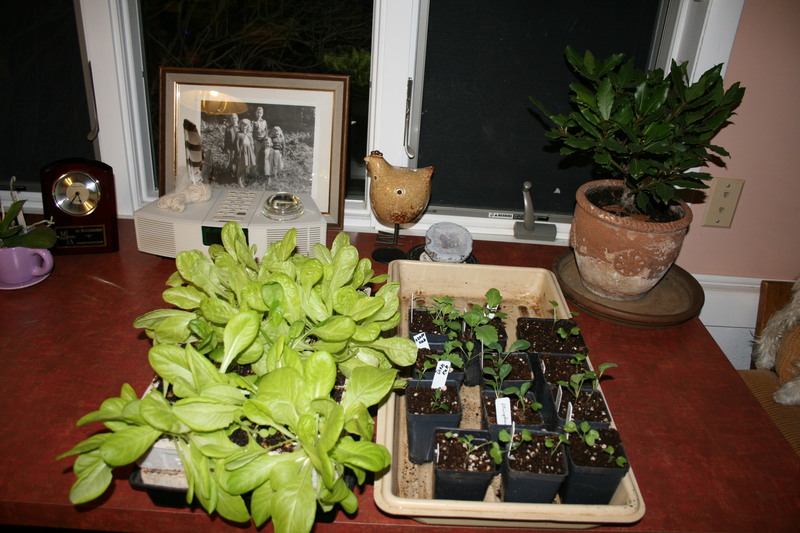 They’ve been moved out of the basement to join the lettuce I started inside and I’m now hardening them off. Both are starting to go outside for quick visits with the sun and the wind. Meanwhile, back in the basement, the tomato and pepper seeds I started in cells just got transplanted into cow pots (which I got online at a great price). 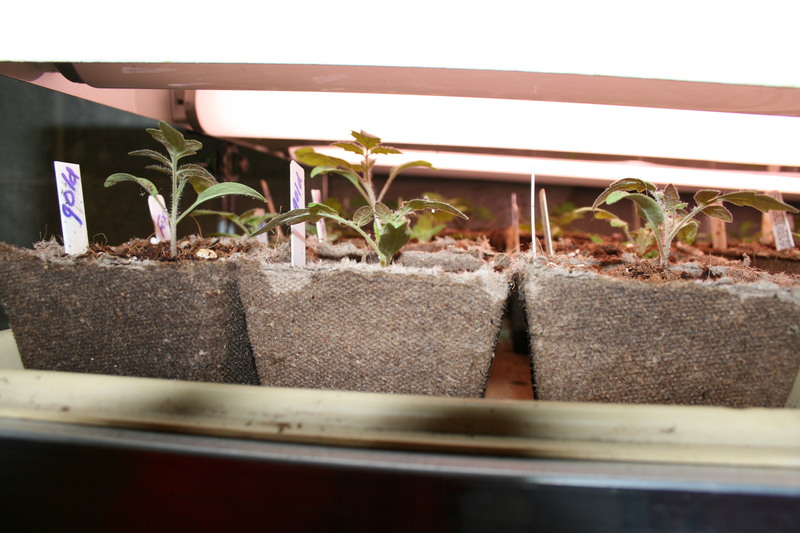 Transplanted tomatoes will live in the basement until early May. These babies will stay in the basement, growing, being fanned and fed, until the first week of May when they will take their place in my office and begin their hardening off process. NOTE: I used to harden plants off haphazardly. Dangerous! 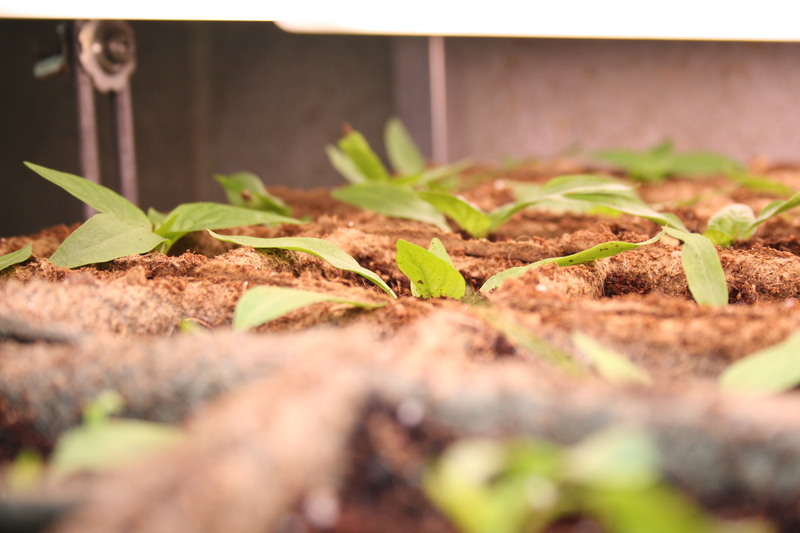 The seedlings you worked and worried over will quickly die if they are not properly introduced to the great outdoors – an hour a day for 2 days, 2 to 3 hours a day for 2 to 3 days, 8 hours a day for 3 days and only then (and only if it’s not hailing or very windy) do they get their first overnight! DOUBLE NOTE: I also used to hurry and plant my babies by May 7th or 8th. Frequently, the ground was too cold for warm weather crops like tomatoes and peppers and they simply stopped growing for a couple of weeks (or forever in some cases). Putting plants in the ground too early can be deadly so give the soil a chance to warm while you get your plants ready for the great outdoors. If you don’t want to start bedding plants from seed and you happen to live in Amish country or near some old, established nurseries, go check out their plants. Maple Shade Nursery in Kirkwood, PA is Amish run and you can watch the women tease baby plants apart and re-pot them right at the register. In the Spring, I can get an early fix just by visiting and strolling through their greenhouses. I supplement my seedlings with theirs and I buy herb plants from them like my Bay “bush”. “Bayby” is a bay plant I picked up at an Amish nursery 5 years ago. 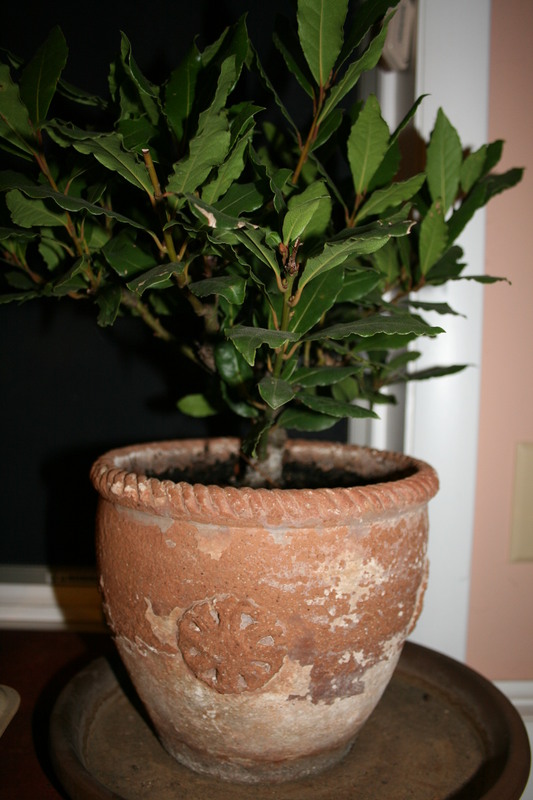 “Bay-by” was in a 3 inch pot when I bought her but now, 5 years later, she graces my desk with her splendid inch wide trunk, stands a foot high and provides me with fresh, tasty bay leaves for my soups and stews. I simply bring her in during the winter then set her out on the patio for late Spring, Summer and early Fall. FYI – the reason I avoid big box stores when it comes to getting bedding plants is because I have NO idea where the seed came from (I want organic and no GMO) or what they’ve been fed. Want to learn more about organic gardening? 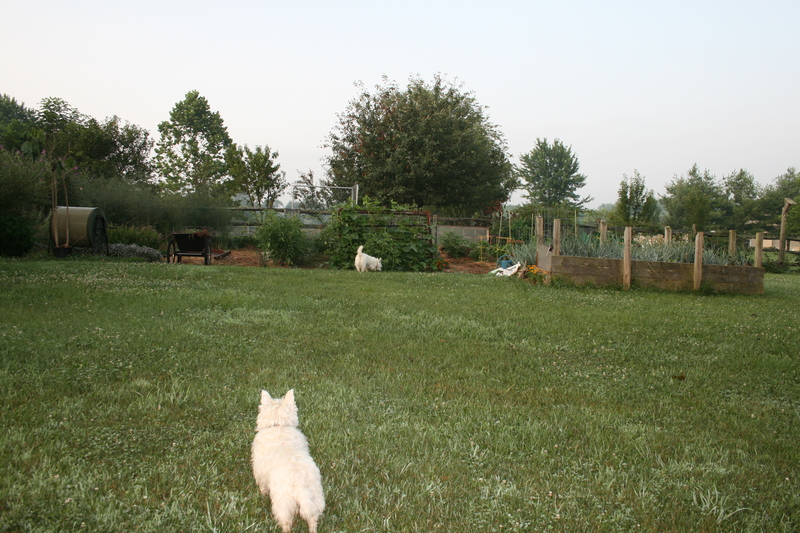 Want to see just how easy it is to grow your own, healthy and organic food. Take a look at my Kindle book – Grow So Easy; Organic Gardening for the Rest of Us. Tis the season for zucchini…fa la la la la la la la! 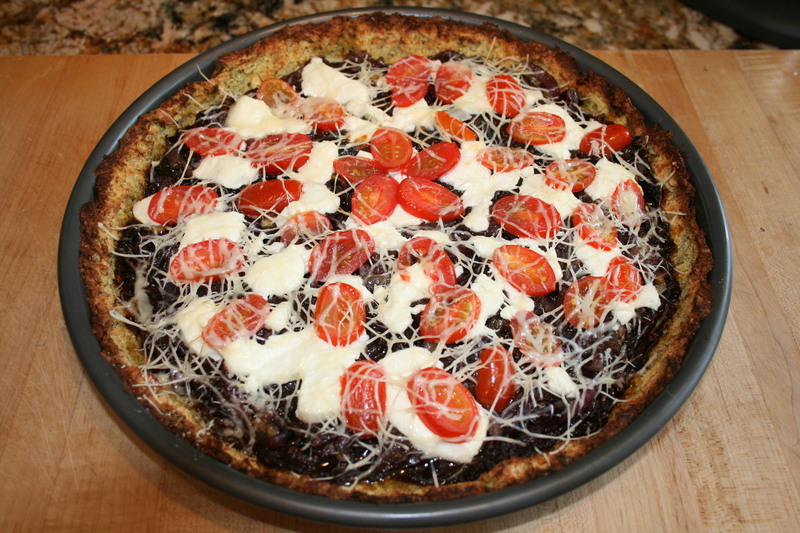 So, I am reposting one of my favorite foods – Zucchini Crusted Pizza. What’s really nice is that I had all the ingredients in house, already. Even more special than that? Almost all of the ingredients came from my backyard garden. I raised the zucchini, garlic, fox cherry and roma tomatoes , onions, basil and oregano. 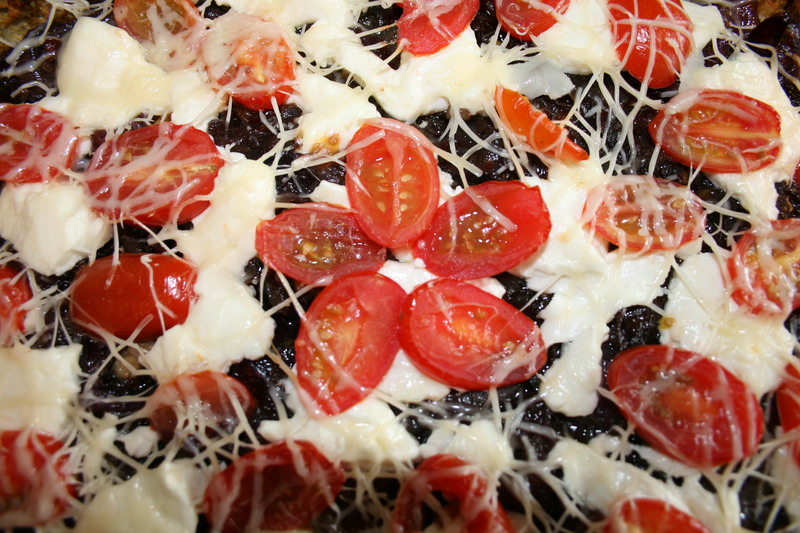 I give Trader Joe’s the nod for the black bean dip (which I mixed with my homemade tomato paste) and the goat cheese. Preheat oven to 550F. If you have a pizza stone, put it in to pre-heat it. I just use a stoneware deep dish pizza pan. In a large bowl, toss the zucchini with 1 teaspoon coarse salt and set aside for 15 minutes. If frozen, thaw out and put into a large strainer. Squeeze the excess moisture out of the squash by wrapping it up in a clean tea towel or piece of cheese cloth and wringing it out, discarding the water. Place the zucchini mixture and using your fingers, spread the mixture to fill the pan or stone pushing it up the edges (if using a pizza pan) so that it forms a edge crust. Bake the pizza shell itself until it starts to brown. NOTE: if your zucchini was too moist, just let the shell cook a bit longer to ensure it’s done, all the way through. Pull the crust out of the oven and top with sauce, cheese, onions and any other ingredients you want, put it back in the oven and bake 10 to 15 more minutes – until the cheese melts and the sauces heat through. FYI this is good hot or cold – in case you lose power! Bon appetit!